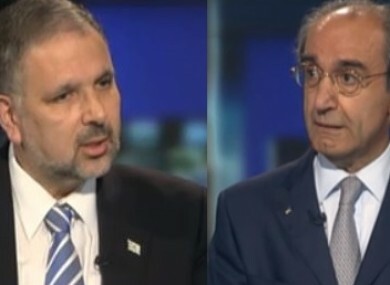 Israeli ambassador Boaz Modai (L), and Palestinian ambassador Ahmad Abdelrazek (R) will appear before TDs and Senators today. MEMBERS OF THE Oireachtas joint Committee on Foreign Affairs will be back to work this afternoon, and their first meeting looks likely to be an intriguing one. Israel’s ambassador in Ireland, Boaz Modai, will be answering questions before the Committee at 4pm, amid near-universal condemnation in Ireland of Israel’s plan to seize almost 1,000 acres of Palestinian land for settlements in the West Bank. Some of the TDs and Senators who make up the 15-member committee have been strongly critical of Israel’s actions during the recent 50-day conflict in Gaza, as well as the latest move, which came after the optimism of last week’s indefinite truce with Hamas. Last night, the Committee Chairman Pat Breen told TheJournal.ie it would be “a nail in the coffin of the two-state solution” if Israel were to go ahead with the plans. Ahead of today’s hearings, Fianna Fáil Foreign Affairs spokesman Brendan Smith told TheJournal.ie he would be asking Modai to renounce the claim to the Palestinian land, as well as urging the Israeli government to lift restrictions on the movement of people in and out of Gaza. Not only is this move ill-advised in the circumstances, it is also contrary to international law. These actions are totally unacceptable… The often promised labelling requirements both at EU and at national level for products from Israeli settlement areas and other sanctions against these goods must be implemented across the Union now. This latest aggressive move is a continuation of [Israel's] deliberate policy of collective punishment of the Palestinian people under the fig leaf cover of security and defence. Modai and the Israeli Embassy has been outspoken and at times controversial recently in their defence of Israeli policy, and response to criticism of it. During the summer the Ambassador labelled the UN Human Rights Council the “Terrorist Rights Council”, during an interview on Newstalk. Earlier, the embassy drew widespread outrage after its official Twitter account tweeted a picture of Molly Malone dressed in a niqab (later deleted), and tweeted another which compared Hamas to Hitler. The Oireachtas Foreign Affairs Committee will also be meeting with Palestinian Ambassador Ahmad Abdelrazek, who will appear before TDs and Senators at 2.30 pm. Abdelrazek has himself been critical of Israel’s actions during the summer’s violence in Gaza. He has also appeared and spoken at a number of Sinn Féin events, including this summer’s National Hunger Strike Commemoration. Email “TDs and Senators will meet the Israeli and Palestinian ambassadors today”. Feedback on “TDs and Senators will meet the Israeli and Palestinian ambassadors today”.